Quick Tips Videos & Sales & Marketing for Professional Services & Sales TipsHow could you make an intangible, like "advice", become tangible? Sales & Marketing for Professional Services & Strategic IssuesSome customers just don't want you....so where are the ones who do? It seems obvious, yet somehow it isn’t. 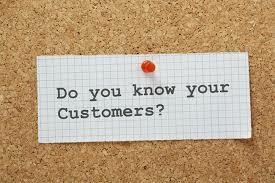 The more you know about your customers the more business you can do with them. Can. Not “will do with them”….but “can”. Market and customer intelligence provides potential business opportunities – if you are able to act upon it. Take a tip on this issue from the big guns of financial services, the ones who make literally billions of dollars of profit every year: The Banks. Their strategy for years has been fairly obvious, and fairly straightforward: Sell products to customers until it is too hard for them to leave, and the key to selling more products is to capture as much information as possible and then be prepared to act upon it. 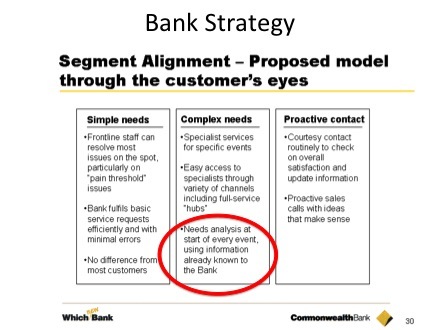 The ideal for banks is to get between 5 and 7 products with a customer because at that point customers are effectively “captured” for a very long time. Each time a product is sold to a customer the bank learns a little more about them, and captures that data. They use the data to understand the opportunities to sell more products in the future. Now I have never worked for a bank so I can’t be 100% sure that this is how it works of course, but I have been a bank customer for a very long time and I have been in competition with them for clients for decades too. I have witnessed how swiftly banks are able to act upon movements in customers bank accounts – and how aggressively they do so on many occasions. I have witnessed how efficiently banks capitalise upon every transaction with a customer: placing money into a term deposit turns swiftly into a conversation about placing general insurance or retirement savings with them as well. This is exactly what I have written about previously in terms of understanding where products address simple needs, and why advisers should consider having a transactional element to their business. It is exactly why advisers need to have excellent CRM systems and put serious effort into capturing customer data: that is key business intelligence. It is exactly why using transactional elements together with increased knowledge of customers helps to identify the higher value advice work that leads to deeper and more profitable customer relationships. 2. Sell someone a product that easily and quickly solves their immediate need. You have to sell something to get a customer to begin with. 3. Learn as much as you can about them; and capture/store that information. Gather intelligence. 4. Continually make the customer aware of everything you can do or provide to them. Marketing is constant. 5. Mine the data you have on customers. Understand key triggers and movements that highlight changing needs, and therefore an opportunity to deliver further product solutions or advice. Be prepared to act when your data suggests there is an opportunity. 6. Keep focussed on the goal: increasing wallet share to the point where it is too difficult for the customer to go elsewhere. It is not complicated to understand of course, but it is not simple to achieve either. Most advice businesses are not aiming for billion-dollar-per-quarter-profits but the principles of building a super profitable business are too similar to ignore. Watch what the big banks do, and learn from them. After all, they are running more profitable businesses than most of us. Some customers just don’t want you…so where are the ones that do?